JNV Selection Test 2019, Navodaya Entrance Exam dates, NVS Schedule 2019-2020. Navodaya Entrance Exam date 2019: NVS Exam date, JNV Selection Test 2019 schedule for Navodaya Entrance Exam 2019 for admission into Navodaya Schools.Navodaya Vidyalaya Samithi, Ministry Human Resource Development, Department of School Education and Literacy has given the Activity Schedule in April for Conduct of JNV Selection Test 2019 for Class VI admissions to the Deputy Commissioner, NVS, All Regional Offices and all the Principals, JNVs. JNVST 2019 Examination to be held on 06.04.2019. Conduct of Jawahar Navodaya Vidyalaya Selection Test-2019 in all Phase I JNVs (Summer,Winter& Extreme Winter bound JNVs) on 06-04-2019: Navodaya 6th class entrance exam date, Admit Cards /Hall tickets 2019 download: Jawahar Navodaya Vidyalaya Selection Test-2019 (Phase-2) in respect of the following Jawahar Navodaya Vidyalayas will be conducted 06-04-2019. Arrangement will be made to download the admit cards by the candidates from the website of NVS – www.nvshq.org. Candidates may contact Principal of JNV concerned and collect Admit Cards, in case of difficulty. The date of Jawahar Navodaya Vidyalaya Selection Test for admission of students to Class VI for the session 2019-20 was notified as 6th April 2019 in respect of Summer Bound, Winter Bound and Extreme Winter Bound Jawahar Navodaya Vidyalayas respectively. Jawahar Navodaya Vidyalaya Selection Test 2018 for Summer Bound JNVs is postponed and JNVST will be conducted together for all Jawahar Navodaya Vidyalayas in one go(06-04-2019). Navodaya Entrance Exam date: Nearly 5 lakh more students have registered for admission to #NavodayaVidyalayas this year due to introduction of simplified one-page application form & online registration system, transforming education. As many as 27 lakh aspirants have registered for #NavodayaVidyalayas admission test for VIth standard to be conducted on 06-04-2019 for Aacademic Year 2018-19 as compared to 22.5 lakh last year. This reflects the growing quest for #QualityEducation in rural India. Admission to JNVs is made at the level of Class VI on the basis of a test conducted on All India basis. For admission of students in Class VI for academic session 2019-20, entrance examination is scheduled to be held on 06-04-2019 for summer bound, winter bound and extreme winter bound JNVs respectively. While NVS is making all efforts to give adequate publicity to this examination, your support and cooperation in disseminating about NVS and the entrance examination would be of immense help. I have advised the regional Deputy Commissioner to apprise you of the same personally. Kindly issue instructions to District officials including District Education Officers and Head Masters of all Primary Schools to give adequate publicity for this online application for the Navodaya Entrance examination and encourage the children to seek admission in Jawahar Navodaya Vidyalayas in Class VI. This will help in enrolling more students, particularly girls, SC, ST & minority children for admission to Class- VI for the ensumg Jawahar Navodaya Vidyalaya Selection Test (JNVST). 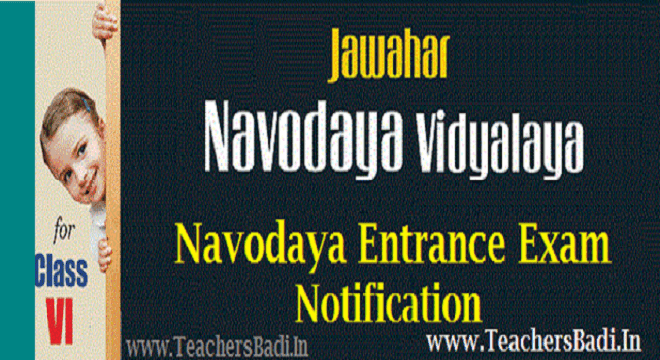 Navodaya Entrance Exam Date : April 6th, 2019. Navodaya Vidyalaya Samiti, An Autonomous Organisation under Ministry of Human Resource Development, Department of School Education & Literacy, Government of India. Admission Notification - Last date of Application through Online. Navodaya Vidayalaya Samiti notified for admission process for admission to class VI in Jawahar Navodaya Vidyalayas through JNVST-2019 for the session 2019-20. Registration of students is in progress through online & offline mode. Last date to apply for JNVST 2019 up to 30 November. Last date for submission of JNVST-2019 Class VI admission applications through online mode only. navodaya entrance test 2018,navodaya vidyalayas admissions 2018, navodaya 6th class admissions, jnvs selection test 2018,jnvs 6th class entrance exam 2018, nvs, entrance exam date, eligibility, how to apply, application form, fee, last date, Communicating complete details of Custodian Banks as per specific proforma viz State Name and Code; District Name and Code, Block Name and Code, Centre Name and Code, Name and Designations of the Custodian, Complete Addresses of the Bank with Pin Code, Mobile No.